Newmarket Racecourse – based in Newmarket, Suffolk, is considered the headquarters of British Flat racing. It is also home to the largest cluster of training yards in the country – including Champion Trainer John Gosden’s, as well as many key horse racing organisations, including Tattersalls, National Stud and the National Horseracing Museum. Newmarket hosts numerous events throughout the season; varying from multiple novice contests for the newbies, infamous heritage handicaps, trials for Group events, and staging the big contests themselves. In total, it hosts nine of British racing's 36 annual Group One races, including the Guineas – two of the country’s five Classic races, which we will touch on later. The Craven meeting and the July meeting are two of the other more significant encounters throughout the season. The story behind the inauguration of Newmarket is rather stranger than most courses. Most tracks are mapped out when planning for future racing, whereas the contours at headquarters sort of just fell into place. In 1605, James I stopped off on one of his ventures when thick fog struck his quest, and discovered that Newmarket had the perfect landscape for hunting and racing. The first recorded race was in 1619, with racing formally established by 1665 on Charles II’s return to the land. Charles was known to attend races often and personally inaugurated the Newmarket Town Plate in the same year. In 1671, he became the first and only reigning monarch to ride a winner at the venue. Up until 1744, the two most valuable races run at the course were the King's Plate alongside the Town Plate. Other meetings were added further down the years – William Craven founded the Craven Stakes in 1771, with the July course created in 1846 to form a different test to what we know as the Rowley Mile nowadays. Like Cheltenham – the home of jump’s racing, the dynamics of Newmarket Racecourse are so large, they have two configured courses - the Rowley Mile Course (named after the favourite racehorse of King Charles II – Old Rowley) and the July Course for the feature events across the summer. Both are wide, bumpy, galloping tracks used only for Flat racing. This course has a mile-and-a-quarter straight (ten furlongs) with many bumps up and down towards the iconic 'Bushes', two furlongs out. The penultimate furlong is downhill with the last very quickly uphill, forming the famous 'Dip', which causes many horses to come unstuck. Races beyond the distance of 1m2f start on the 'Cesarewitch' course, which turns right-handed into the straight. The Rowley Mile is used for racing in the Spring and Autumn, and hosts most of the Group One races staged at Newmarket, including the 2000 & 1000 Guineas. The wide nature of the track means it is able accommodate for the likes of the Cambridgeshire and the Cesarewitch Handicaps, which both have a maximum field size of 35, making them the largest fielded races in Britain aside from the Grand National at Aintree. The July Course has a slightly shorter straight of a mile, known as 'The Bunbury Mile'. After two furlongs, there is a long downhill stretch before a steady climb uphill towards the finish. This course also uses the 'Cesarewitch' course for longer distance races, again turning right into the straight, but is a much tighter turn – almost like a right angle. 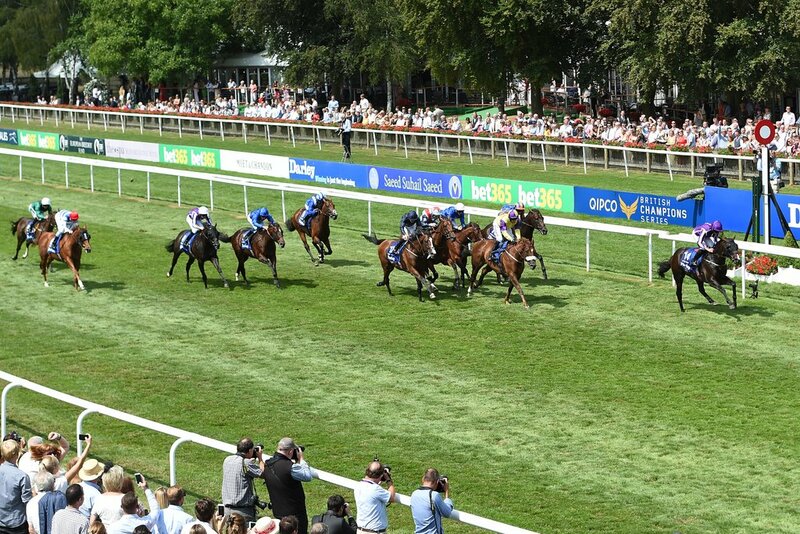 As with the hint in the name, this course is used in July and is sometimes also regarded as the ‘Summer’ course, for the feature racing such as the July Sprint Cup and the Falmouth Stakes. Racegoers at Newmarket tend to mark a trip to Newmarket as a special occasion, and mix a day with the races with the chance to dress up in formal and smart clothing when they otherwise would not. Men sport smart trousers, a shirt and formal shoes to complete the look. Ties are optional, and top hats are not deemed necessary anywhere outside Royal Ascot. There is no formal restriction on wearing jeans, however these are rarely seen in the Premier Enclosure and not permitted in hospitality areas. Ripped jeans are banned, but dark denim is permitted. Ladies can use the day out to pose a unique choice of hat, matched with a clutch. It is not compulsory; most ladies also tend to wear gorgeous summer dresses or smart jumpsuits, depending on the weather. Small skirts are particularly frowned upon, and not considered racing clothing. There is a strict dress code in the Premier, Hospitality and Champions Lawn facilities, with no sportswear, trainers, t-shirts, fancy dress, cargo shorts, ripped or torn denim allowed. Smart tailored shorts are acceptable and along with dark denim as mentioned. In the Grandstand & Paddock and Garden Enclosure, the dress code is much more relaxed particularly in the summer; jeans, smart shorts t-shirts and trainers are very much acceptable. However, inappropriate slogan t-shirts and swimwear are not permitted, nor anyone arriving bare chested. Fancy dress is permitted at Newmarket Racecourses in the Grandstand & Paddock and Garden Enclosure areas, but must be appropriate and not deemed to cause any offence. The Guineas festival is arguably Newmarket’s most prestigious meeting of the year, and yet it comes so early in the season. Three weeks after the trials in the Craven, the Guineas take centre stage on the Rowley Mile in the first week of May, as the first two Classics of the season. Served as the opening leg of the flat Triple Crown - followed by the Oaks/Derby at Epsom and the St Leger at Doncaster, the opening Classic: the 2,000 Guineas operates to find the best three-year-old colt over a mile, and likewise for the fillies over the same distance at the same weekend in the 1,000 Guineas. It forms the opening profile line of the upcoming three-year-olds, and begins them on their quest to bigger and better things down the line. Many horses may go on to find their best efforts over a mile, whereas others continue the Triple Crown hunt to become more versatile, and complete individuals. However, a Triple Crown campaign has been rarely tried in recent years, with multiple top stars making use of their allowances in Europe’s top races again the elder horses. These two contests have been the springboard or starting point and produced several future stars – including the likes of Camelot, Sea The Stars and the almighty Frankel; arguably the greatest flat horse of all time. Since 2001, the 2000 Guineas and the 1000 Guineas Stakes have offered equal prize money, each offering now a purse of £500,000. The Guineas also signifies to many, the end of the jumps season, and the beginning of the flat turf season in the UK. By train, Newmarket Railway Station is just a few miles away from Newmarket Racecourses, with a free shuttle bus service in operation to transfer racegoers to and from the venue. Cambridge Railway Station is also located 14 miles away, with positive connections to London.